If you follow my Twitter feed (@knotellin – there’s a follow button over in the right sidebar), you’ll know that I’ve been tweeting “today’s Lenten meal” every now and then. A few people have encouraged me to talk more about them here. The thing is – I love meat. I could eat meat three times a day – but I don’t. If fact, during most of the year, I only eat meat on special days – Sundays and holidays – but I do eat fish. Now, this brings me to a bit of a problem during Lent, when my Church encourages us to abstain from meat. In keeping with the spirit of the thing – in order to do a little bit more during this special time of year – I abstain from fish during Lent. This makes me a vegetarian for the duration. This year I decided to make a special effort with my Lenten meals. I wanted to make them nutritious, tasty and attractive. The principles: only whole grains, a variety of vegetables, quick cooking and minimum prep time. The meals should be colorful and the spices chosen carefully. Not all my experiments succeeded. You won’t be seeing those here. But I’ll post a couple of the ones that did. The quantities are for one person, with leftovers for another meal. Drain and rinse the beans, and pick out anything that got missed the first time. Rinse again. Heat about one and a half teaspoons of olive oil in the pot you’re going to use for the beans. When it’s hot add 1/4 cup chopped onion, 1 diced tomato, 1 chopped or crushed garlic clove, 1/2 red chili pepper, chopped (or about 2 teaspoons dry). * Add the rinsed and drained beans and pour in 2 cups of boiling water. Add one large bay leaf, salt and pepper to taste. (I prefer freshly and coarsely ground black pepper.) Bring to a boil, cover tightly, reduce heat as low as you can, and simmer. Check from time to time to be sure the beans are covered with liquid. The beans should be tender and ready to eat in about an hour. Pick through and rinse 1/3 cup of rice, put it in the pot. Add 1 tsp of olive oil and mix well. Add a little salt. Pour on 1 cup of boiling water, stir and bring to the boil. Cover tightly and simmer on the lowest possible heat until just before all the water is gone. (This takes some practice.) Remove from heat. Cover with a clean kitchen towel and put the lid back on top of that so that the remaining water steams into the towel and the rice is fluffy. The green salad is just the usual. I dress it with olive oil, lemon juice and salt, Israeli style. Now, the apple is really cheating. I use Granny Smith apples. Wash and cut into chunks or slices. Mix in crushed ginger or dust with powdered ginger. Add powdered cinnamon to taste. Put it in a covered, microwave-safe container and nuke on 100% for two or three minutes, depending on your machine. That’s it. This is also lovely on ice cream, if you are so inclined. So. Your turn now. How would you improve this recipe? 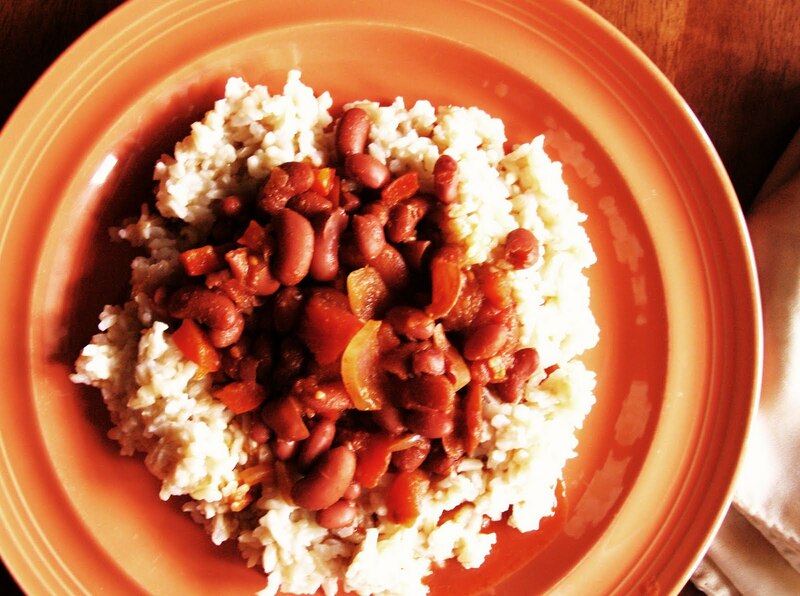 What is your favorite way to cook beans and rice? *These are the amounts for normal people. When cooking for myself, I amp up the hot stuff. Well, actually at the polite request of a popular blogger, here is the Tuscan white bean soup I made the other night. It was delicious. This version is vegan (though I am not) but I’ll show variations at the end. It is quick, easy, and I found it delicious. Prep time, 10 or 15 minutes; cooking time, an hour. “Jerusalem style” does not refer to local cuisine this time; it means without the canned and packaged ingredients you can get it in places like North America and Europe. This quantity made two bowls of creamy, delicious soup. Soak 1/2 cup of dry white beans overnight. The next day, pick out the yuckies and rinse well once or twice. Drain. Chop 1 small onion and cook in 1 tbsp of olive oil until soft. Add one large or two medium cloves of garlic, chopped finely, and continue to cook. Dice 2 carrots and slice 1 or 2 stalks of celery. Add the vegetables to the onion and garlic and cook until everything is soft. Add 1 liter of vegetable broth and mix in the soaked, rinsed, drained beans. Bring to a boil. Add a couple of sprigs of fresh rosemary or 1/2 tsp of dry. Salt and coarsely ground black pepper to taste. Reduce heat. Cover and simmer for one hour. Make sure the beans are fully cooked, but they should be done after an hour. Remove half the soup and spin it in the blender to puree the beans and vegetables. Return the puree mixture to the pot. Bring to the boil one more time, then serve hot. Soak, rinse and drain the beans. Saute the onion until soft, then add the garlic. Add carrots and celery once the garlic is soft. Add the broth and the beans and bring to the boil. Add the rosemary, salt and pepper to taste. Reduce heat and simmer for one hour. Remove half the quantity and puree it, then return to the pot and mix. Bring to the boil one more time and serve. A nice serving suggestion for non-vegans is to ladle into bowls, then brush olive oil on the soup and top with grated parmigiana cheese. Variations include adding tomatoes and/or kale to the soup. Meat eaters can try adding diced smoked meat to the soup or using chicken broth instead of vegetable. Now it’s your turn – what winter soups do you like? Let’s keep warm together!